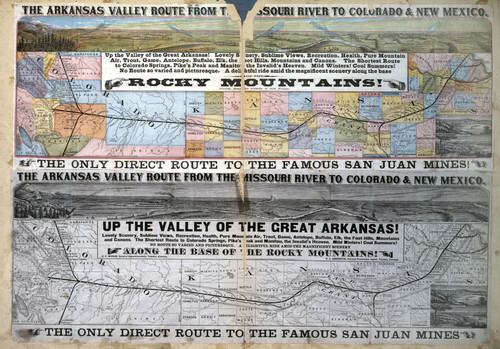 These Atchison, Topeka & Santa Fe Railway maps encourage travel on the ATSF lines along a scenic route from eastern Kansas to the base of the Rocky Mountains. The maps claim this to be the only direct route to the famous San Juan Mines and the shortest route to Colorado Springs, Pikes Peak and Manitou. Lovely scenery, sublime views, wildlife, recreation, and pure mountain air are some of the reasons given for making this journey.